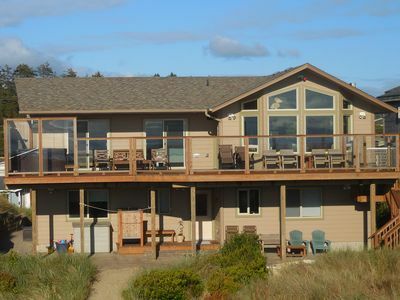 This beachfront house has everything you could want during your next stay on the Oregon Coast. It features flatscreen TVs, a pool table, an arcade game, and most importantly: rare private beach access directly out your front door. 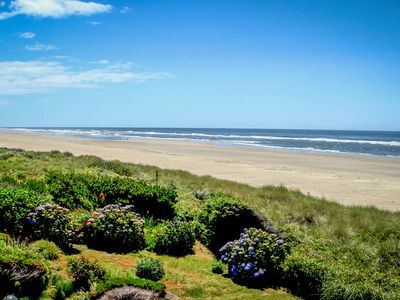 You are 39 private steps away from the middle of seven miles of perfect golden sand. The exploring is endless. 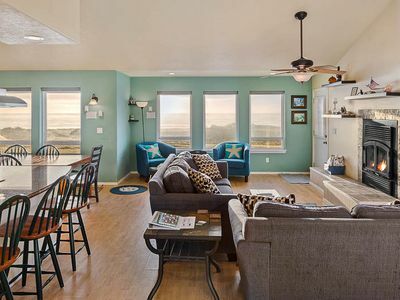 The home has a comfortable look and feel as, up until now, it was a one-owner, family-owned beach getaway that was never on the rental market. This rare, previously exclusive, private gem is, for the first time, available to the public! This means you! 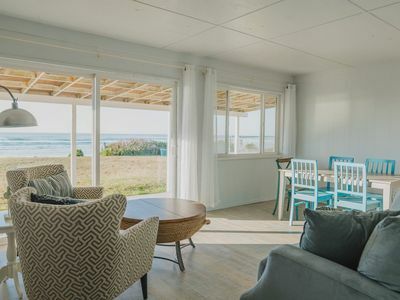 Locals have said that this home sits at a perfect location for crabbing and fishing right at the sea shore at dusk when the tides go out (a fishing pole is provided for you in the home). 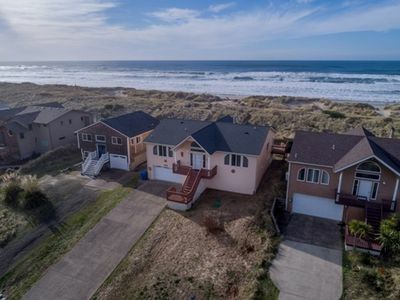 This home features a theme park-esque, full-size, three-story tower light house with an authentic spiral staircase that features unreal panoramic ocean views from the tower’s full surround top deck! 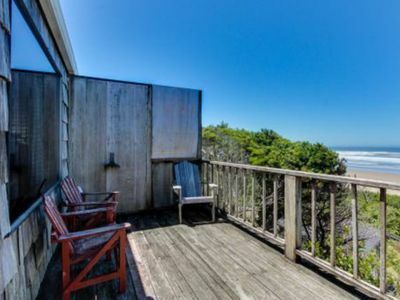 Yes, like a real lighthouse, you can exit the top third-story deck and walk around 360 degrees or sit on the bench with your favorite refresher and soak in the sun and second to none views. We are the tallest outlook on the entire beach! 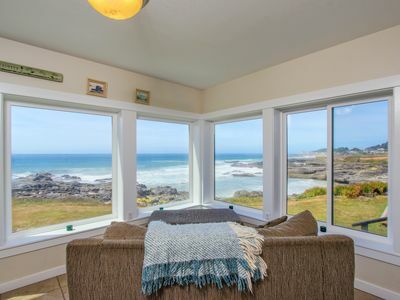 You can literally see from Yachats to Waldport with this central, completely uninterrupted viewpoint, which includes a 'New York'-style, professionally-installed tourist binocular. Sit atop at night and see shooting stars and the glorious Milky Way - no light pollution here! The tower itself has lounging areas on the interior of each level, with their own spectacular views. 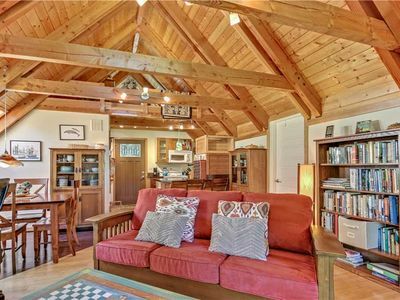 The main level of the tower has two beds and is perfect as a 'boys' room or general recreation room, as it evokes being on a pirate ship with its beautiful wood build and non-linear format, all custom made from the original owner, who was a carpenter. For any age, the tower portion is just a very rare and unique piece of “one-off” architecture to experience. Many memories await you in the tower! 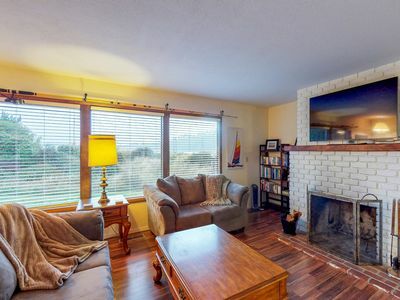 The house itself is extremely unique - perfectly portioned, large-square footage rooms with their own doors means that adults can lounge and have serenity while youngsters play in another room. 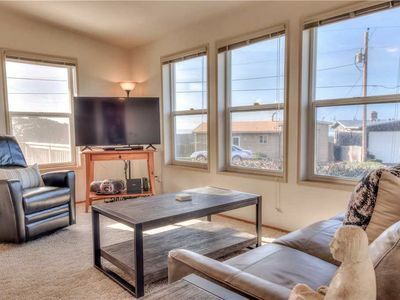 A large interior window (nursery-style) between the two spacious living rooms means you can keep tabs on younger ones while still enjoying your own space, with a curtain when you want and need your privacy. Upstairs is a great recreational room with a pub-size pool table and vintage arcade video game with tons of games on it. 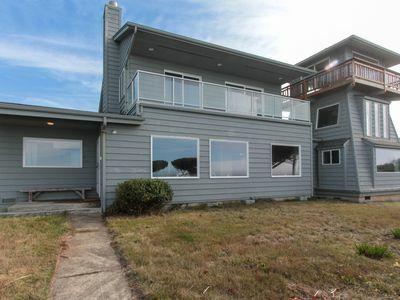 This level also features a huge master bedroom with its own deck. 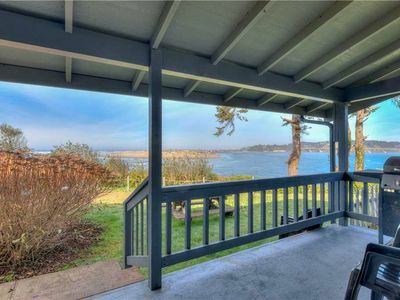 Enjoy the sunset with your favorite glass of wine on this outside deck with unfettered views left and right and retire directly to your comfy bed. This is the kind of vacation you deserve. The downstairs has two private bedrooms with a fully appointed bathroom for each, including separate showers, toilet, and sink, which can be closed off via hallway doors to create a private “suite-style” experience. The house also features two sofabeds: one upstairs and one down for extra guests. 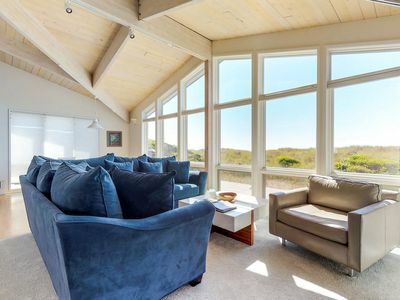 The house sits on half-acre of land, one of the biggest on the beach, and features a hammock perfectly situated for a one-of-a-kind view or simply for lazy afternoons to relax and hear the ocean's soothing roar. As you will see, most properties around us are eroding greatly and their stairways have either eroded away, or it is impossible to have one, and most do not. Our property is one of the few entirely protected by a rock wall/ridge filled with rip/rap (foliage), which has protected this house entirely from erosion for over 50 years! This makes our front yard 100% safe and our poured concrete steps to the beach 100% reliable. In fact, our poured concrete steps are more reliable than the wooden one at the motel a ways down the beach, which itself is private and used only by motel guests. Your visit and repeat visits will always be consistent, and you will always have your own, unshared, private and secure access to the beach. Guaranteed. 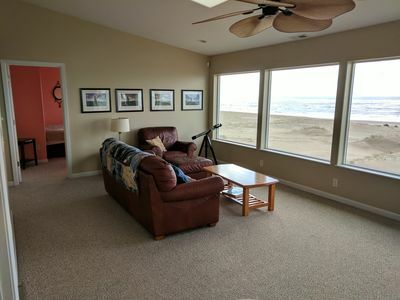 The home is disability friendly with two ramps for small steps, shower seat, long handled shower wand and wide doorways for easy wheelchair mobility, as well as two masters on the main floor. 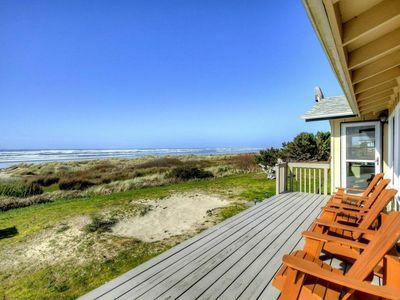 Yachats (pronounced “YA-HAHTS”) is about a five-minute drive to the south, where you can find excellent dining options, as well as necessities. Yachats is like a Cape Cod-style town, full of character and “non-franchise,” unique outlets from espresso cafes to ocean-front dining. For a town of its size, there is, surprisingly, always something new to see or experience. 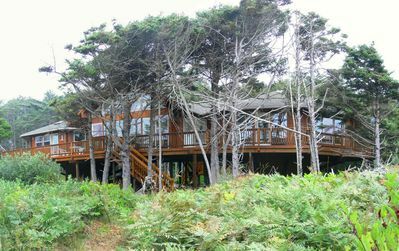 They have their own Yachats Brewery and the famous Yachats Underground where they have live music every Thursday night. Cape Perpetua is a bit farther south from Yachats, where you can do a bit of hiking and sightseeing or marvel at the natural spectacles Devils Churn and Thor's Well, which lie just to the north of the home and south of Cape Perpetua. Also south are the Sea Lion Caves - very much worth seeing! And 50 minutes to the sand dunes in Florence! There's a room when you first enter the house through the back door marked 'Beachy fun things'. 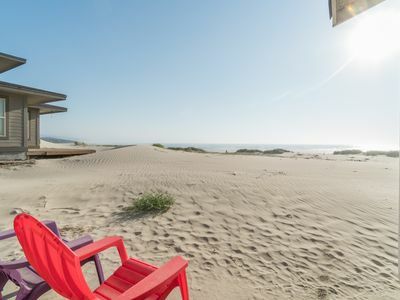 That’s where you’ll find the horseshoes and volley ball net to play on the beach or the kites, sandcastle toys, and beach chairs, along with the hammock (please take it down at night so the wind doesn’t take it away. As well, enjoy fishing right out the back with the fishing pole provided. Feel free to make fires on the beach to enjoy s’mores or smokies. If you like running or walking, you should know that you can walk the beach south all the way to the 804 trail that takes you to popular dining at the waterfront Adobe Restaurant and Lounge. Parking Notes: Please be respectful of the next door neighbors when parking. Park in front of the house and the garage. 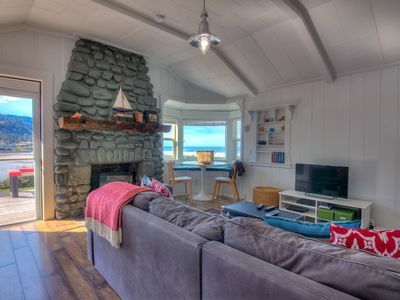 Dog-friendly oceanside cottage - 2 units in 1. 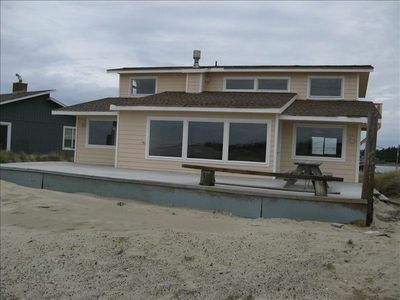 Easy access to secluded beach! 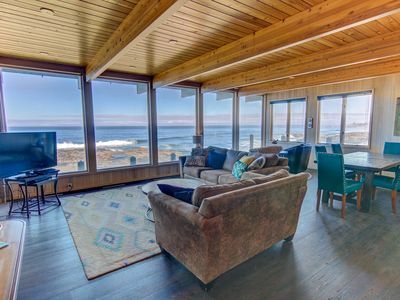 Amazing Panoramic Ocean Views in Yachats, 2 Fireplaces! Free Night! 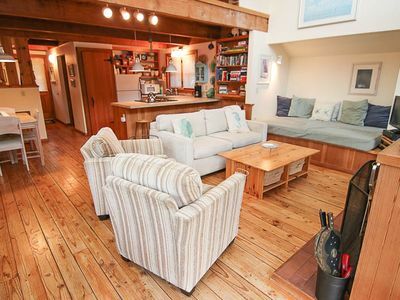 Romantic Cottage Perfect for a Couple or Family Getaway!